Cimarron County is the westernmost county in the U.S. state of Oklahoma. As of the 2010 census, the population was 2,475, making it the least-populous county in Oklahoma. Its county seat is Boise City. Located in the Oklahoma Panhandle, Cimarron County contains the only community in the state (Kenton) that observes the Mountain Time Zone. Black Rock Mesa, the highest point in the state, is in the northwest corner of the county. Throughout most of its history it has had both the smallest population and the lowest population density of any county in Oklahoma. Cimarron County was created at statehood in 1907. Before the Oklahoma Organic Act was passed in 1890, the area had belonged to what was known as "No Man's Land," also referred to as the "Public Land Strip." This was a relatively lawless area, with no organized government, and several outlaws sought refuge within its borders. In 1890, the strip became known as Beaver County, Oklahoma Territory. Informally, it was known as the "Oklahoma Panhandle." There were only two communities in the strip. One, Carrizo, had 83 residents in 1890, while the other, Mineral City, had 93 residents. Otherwise, the land was used primarily by sheepherders from New Mexico. Seven communities vied to become county seat after statehood: Boise City, Cimarron, Doby, Hurley and Willowbar. A county election in 1908 selected Boise City. Railroads came late to this part of Oklahoma. The Elkhart and Santa Fe Railway built a line from Elkhart, Kansas through Cimarron County in 1925. It completed the link into New Mexico in 1932. Service ended in 1942. The same company built a line from Colorado to Boise City in 1931 and extended it into Texas in 1937. This line still operates and in 2000 was part of the BNSF system. According to the U.S. Census Bureau, the county has a total area of 1,841 square miles (4,770 km2), of which 1,835 square miles (4,750 km2) is land and 6.1 square miles (16 km2) (0.3%) is water. It is the fourth-largest county in Oklahoma by area. It also has Oklahoma's highest point at 4,973 feet (1,516 m) (AMSL) on the Black Mesa. The northern part of the county is drained by the Cimarron River, which flows eastward, then turns north into Kansas, The southern part is drained by the North Canadian River (also called the Beaver River). The man-made Lake Carl Etling lies inside Black Mesa park. Cimarron County is the only county in the United States that borders four states: Colorado, Kansas, New Mexico, and Texas. As a result, Cimarron County is the only county in the United States to border at least five counties from five different states (one from each of the four aforementioned states, plus one in Oklahoma and a second county in Texas). A location 300 yards (270 m) east of US 287-385 and 1.75 miles (2.82 km) south of the Cimarron River is the only place in the US less than 27 miles (43 km) from five different states: 26.99 miles (43.44 km) from Kansas, New Mexico, and Texas and 7 miles (11 km) from Colorado. As of the 2010 census, there were 2,475 people, 1,047 households, and 705 families residing in the county. The population density was 2 people per square mile (1/km²). There were 1,587 housing units at an average density of 1 per square mile (0/km²). The racial makeup of the county was 84.7% White, 0.2% Black or African American, 0.8% Native American, 0.3% Asian, 12.1% from other races, and 1.8% from two or more races. 20.8% of the population were Hispanic or Latino of any race (16.4% Mexican, 1.4% Spanish, 0.2% Salvadoran). The county economy has been largely based on cattle ranching and agriculture throughout its history. Wheat and grain sorghum are the most important crops. 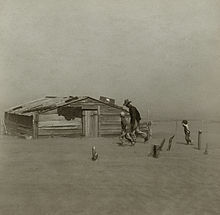 The Dust Bowl devastated the county during the 1930s, and the deluges of 1942-1945 destroyed what was left; the economy had to be completely rebuilt. Oil and natural gas production became important in the 1960s, and a gas plant near Keyes began producing helium in 1959. In 2000, Cimarron County had the ninth largest per capita income of all Oklahoma counties. This page was last edited on 13 March 2019, at 22:47 (UTC).